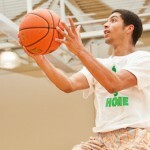 Class of 2016 point guard Jared Harper came to EBA All-American Camp ready to lead by example. BUFORD, Ga. – The Elite Basketball Academy All-American Camp is designed as a place for college prospects to compete and showcase their talents. It’s a proving ground for players to compete and receive elite level skill development. Add that to the top shelf game play and there is no stage better suited for the best to shine. 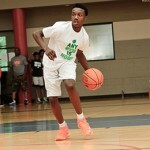 We take a look at class of 2016 prospect Jared Harper’s performance from the camp. 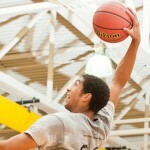 Harper is in the process of showing that he is one of the state’s elite prospects in the junior class. 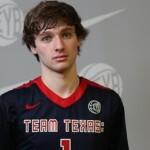 His performance at the #EBAAllAmerican Camp made it clear that he belongs in the discussion. The 5-foot-10 point guard handled the basketball, knocked down the open jump shot and was the quarterback on his camp team in every game. Like Drew Brees or Russell Wilson, Harper lacks prototypical size at his position. But like those two what Harper lacks in size he more than makes up for with his ability to make every play. From our evaluations in Minnesota to St. Louis to the one here this weekend, Harper has proven himself capable of being productive on all of the big stages provided to him. Harper was outstanding here putting on a show that reminded myself and Jonathan Hemingway of the one that class of 2015 point guard Damontrae Jefferson of Milwaukee, Wisc. 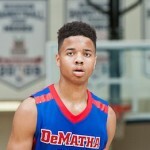 (click for NBPA Top 100 writeup), put on this summer at NBPA Top 100 Camp. Like Jefferson who sits in at No. 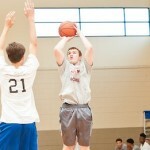 82 in the senior class, Harper is playing his way right into the mix for the BrandonClayScouting.com ELITE National Rankings in his class. Harper showed real shooting range and the ability to use the high screen roll to get downhill. When the defender went under, the four-star point guard calmly stuck the 3-pointer. In a marquee matchup with classmate D’Marcus Simonds of Buford, Ga., Harper went toe-to-toe providing a show that stole the spotlight on the camp’s opening day. With a full slate of Honors and Advanced Placement class on his schedule, Harper gets it done in the classroom as well. Look for him to have a breakout high school season while sharing the backcourt with 4-star senior guard Ty Hudson at Pebblebrook.